For Mexico, the host (Marco) places the first number in the first slot during the explanation as an example of what to do with the rest, so the contestant has to get at least one of the last 5 correct to continue. Hmm...that definitely didn't happen on the one I watched, but then again, that was also the first time they played it. They probably changed it later on after they realized how silly it looked. For the French version, one number from each section was already used in the opening 'wrong' price. You'll notice the first set of numbers has 0 as an option, which was actually a legitimate and correct option for the first number in the price in one of the playings I saw. Also, the French version is a touch screen that is less responsive than the early Double Cross screen, so it is pretty tedious to watch. The contestant has to drag the wrong numbers back to their respective sets before dragging their new guessed number back to the middle. This creates the problem of the contestant potentially forgetting which wrong numbers they've already tried. There is nothing about this quote that doesn't make the producers sound like idiots. Most of the Lucky $even sets look like low budget versions of our game set. The UK Bruce and Joe presentation on the windshield of the car is pretty cool though. What on earth is going on in the Spain 88 set? It looks like some kind of complex math equation being performed. The French Cover Up sets are quite...interesting. They look like circuits or the inside of a computer chip. The Australia set makes me think of our Buy or Sell set. The Spain '88 Lucky Seven looks like they're playing baseball. Going back a bit, the Vietnam '12 Grand Game is by far the ugliest of them, with its ugly number font and vomit-colored background. I personally feel the giant Chinese and French Let 'em Roll slides are overkill; this is one instance in which the US set strikes just the right balance. I see that using 8's and 9's in Lucky 7 isn't just a Mike thing. Once again, brosa will go at his pace. Stop posting stuff like that. Come back Monday and try again. You were warned once. Now you've been punished. Screw this up one more time, and I'm getting rid of you. Couple vids to add to this for the 80's Aussie run just for future reference (Original that is, two of the few actual clips of it on YT, I think the only two that feature a pricing game played too at that), one is a Range Game playing (with a $50 range and an EVIL setup to boot), the other is a Grocery Game playing although it cuts off before it finishes (was gonna be a loss though by looks of it). Interesting note to that one is that at least for that era, they went by the same rules as here, with a $6.75 to $7.00 win range. On Lucky Seven, I grew up with the Australian 90's series so only ever knew it as One Dollar Deal. In hindsight it seems an odd name change (although it still fits the game), particularly when the previous series in 1989 had it as Lucky Seven. Never liked the game as it felt too hard having to guess 5 numbers with just 7 dollars, plus the prop was a bit dinky. The flip panels for the numbers were neat through. I find the weird angle the Indonesian L7 is on to be amusing. It's like they accidentally made it too long. On Cover Up, again I never liked the Australian version due to the colour scheme and the weird extra bit to the right of the 5th column of numbers. It's interesting to see that Russia did away with the starting wrong numbers. What's up with the barrels on the side of the France 09 and Portugal Range Game sets? I assume the contestant was allowed to move the range up and down like the number in Magic # can be adjusted up or down? Don't really get the buried treasure theme in Columbia's Flip Flop, but the sun and moon theme in Mexico's Flip Flop is neat. Looks like Mexico is the only country that kept the photo theme that our Freeze Frame set has. The other ones have a carnival vibe to them, especially Russia. Mostly boring or odd Double Prices sets, a few are very close to what ours looks like and most aren't super different. The Side by Side sets aren't that different from our's. Columbia's looks quite interesting glowing like that. Quite mean setups in the Australia and Portugal pictures. 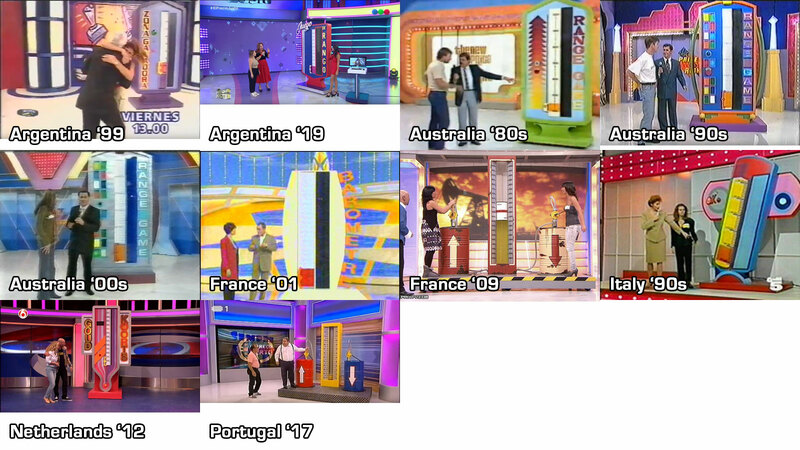 Were the Pakistan and UK Leslie versions two-prize games, with the idea to choose the two out of the five prices for the prizes? Forgive me if I’m wrong, but I believe that you have the Mexican Double Prices (two versions) mislabeled as being from Spain. Thanks, you are correct. I actually love the Mexico 2010 Double Prices. DP is the one game that international series should be able to add their own personality and theme to due to how simple it is, and Mexico does this the best (although it does kind of look like a head with eyes and mouth). As with One Dollar Deal/Lucky Seven, I only ever knew DP as "2 Price Tags" growing up from the Australian series. Never liked seeing it show up, although in hindsight it is neat seeing it played on the turntable. I love the color schemes for the Australian and UK Bruce/Joe Side By Side sets. I think the most interesting takeaway from this batch of pictures is that a version of the show recent enough to have the Carey logo used the British version of Side by Side that hadn't been played since the late '80s.